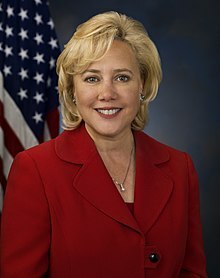 Mary Loretta Landrieu (/ˈlændruː/ LAN-drew; born November 23, 1955) is an American politician. She served as a U.S. Senator of Louisiana from 1997 to 2015. Landrieu is a member of the United States Democratic Party. She was raised in New Orleans. Her brother Mitch Landrieu is the current Mayor of New Orleans. Her father Moon Landrieu also served as Mayor of New Orleans. She is considered a conservative Democrat, often opposed to the views of many others within her party. She lost re-election in 2014 to Republican U.S. Representative Bill Cassidy. This page was last changed on 22 April 2019, at 17:16.